I have seen the future of semi-auto rifles, and it is the ARAK 21. Made by Faxon Firearms, a steel products company that’s relatively new to the firearms market, the ARAK 21 (herein called ARAK) is an upper receiver that attaches to any AR-15 lower and converts the rifle to your choice of 5.56 NATO, 7.62×39, or 300 Blackout calibers. 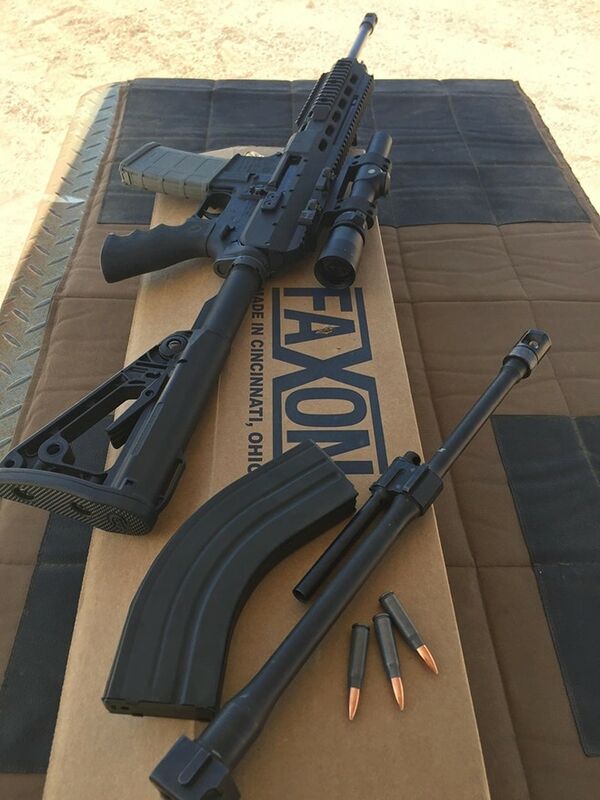 Faxon also sells complete rifles with the ARAK upper. In this test, we were provided the 18-inch barrel, 5.56 and 7.62×39 models of the ARAK . We tested the upper attached to Colt and Battle Rifle Company lowers. Since the ARAK isn’t a full firearm, shipment to my FFL or my residence was an option. Attachment to an AR lower was as easy as attaching the regular upper. Secure the two takedown pins, and it’s good to go. There’s plenty of room for accessories, with a full-length Picatinny rail on top and shorter sections of rail at three-, six-, and nine-o’clock. The side and bottom rails are removable by removing two screws each. However, they also serve to keep the shooter’s hands from being in direct contact with the handguard, important for reasons to be described later. Sights aren’t included. The top rail is marked with the T-numbering system, so on one range session we attached a red dot sight on the same mark as it is on its usual rifle. Though shot groups were a bit high and right, hits on a torso-sized target at 25 and 50 yards were combat-accurate without any adjustment. Being gas piston-operated, the ARAK’s operation is self-contained with no potential for conflicts with the lower. It includes a four-position gas block adjustment knob, potentially needed for use with a suppressor. One setting puts the rifle in single shot-only mode. Since it cycled dependably on the mode it was shipped in, I didn’t change the setting. The upper, with the slightly lighter 5.56 NATO barrel, is a hefty 5.5 pounds. Incidentally, the company makes a pencil barrel option, which reduces weight by 0.3 pounds. The 20-inch barrel increases the weight by 0.5 pounds. Earlier versions of the ARAK are shown on some online reviews. A feature that’s apparently standard now is fully ambidextrous design. A truly unique and utilitarian feature is the six-lug bolt with an extractor that can be changed to eject left or right. There’s no dust cover on either ejection port. I’ll admit to doing a double-take a few times at the sight of a chamber I could see right through! Another ambi feature is the charging handle. It’s located at either three- or six-o’clock in a forward position close to the far end of the handguard. It’s operable from either side whether shooting right-or left-handed. Cool thing is, you can change it to the opposite side. It seems to make the most sense for a left-handed shooter to charge using the right hand, and that’s how our model was set up. It proved to be just fine for right-handed operation, so we left it that way. A person could learn to love loading their rifle this way, as compared to a traditional AR charging handle. There is no reciprocating action to the handle during firing. It’s in easy reach, and the positive SLAM forward when the handle is released leaves no room for an out-of-battery misfeed. My only criticisms here are that it does take some getting used to; I kept reaching for the charging handle in the wrong place when loading. The other is that the handle eliminates the attachment of lights or other accessories on the same side. While it folds flat when not in use (which I repeatedly forgot to do), the handle could potentially catch on gear when being transported on foot … this isn’t a big concern, but a potential annoyance. The ARAK ran flawlessly with 5.56 and .223 brass-cased factory ammunition. With 7.62×39, it ran well with Winchester brass-cased ammo, but had some failures to fire with steel-cased TulAmmo. The product website does issue a warning about the likelihood of this with 7.62, and suggests a heavier- hammered trigger, for which a spring is available. Faxon sells the spring as well as provides a link to a suggested replacement HiperFire trigger. I’d just as soon run decent ammunition and keep the other conveniences of the ARAK platform. It’s been a hot, hot summer here in the southwest, and the whole works heated up rather fast. It literally became impossible to rest the upper in the forward hand after about 50 rounds, there was so much heat transfer even into the rails. The 100-plus degree weather wasn’t helping. I found the easiest solution to be stabilizing the gun with a hand gripping the front of the magazine well rather than the stock. Problem solved. Accuracy tests with the ARAK have been done online, so we didn’t repeat the exercise with our less-than-match grade FMJ. Suffice to say, it’s plenty accurate as a battle rifle, with point-and-shoot consistency for torso-size targets within at least 200 yards. Stretching its range, and going for better precision, could certainly be done with good ammunition, supported shooting positions, and careful sight adjustment. The heaviness of the ARAK aids shooting accuracy by lending a bull barrel effect – 5.5 pounds isn’t a lot, but the weight is concentrated in the forend. With a lower, it is a bit heavier than average. The weight soaks up recoil, making shooting pleasant and follow-up shots efficient. A hex screwdriver is needed to change barrels. Faxon made a good move in using captive (they can’t get lost) screws to secure the halves of the handguard together. Loosening them allows the bottom of the handguard system to be lifted away, exposing the barrel. Another captive pin gives access to removing the bolt, firing pin, and recoil spring. Thankfully, the company clearly marks the bolt/firing pin combinations by wrapping them in a bright rubber bracelet-type band that has the caliber printed right on it. To insert the wrong combo of barrel and bolt or firing pin could be dangerous. Changing calibers is a simple process, but one that takes time if one doesn’t stay in regular practice to recall the sequence of steps. The base of the barrel is fitted like a jigsaw puzzle into the upper, and what consumed time was being “so close” but not quite perfect during assembly. 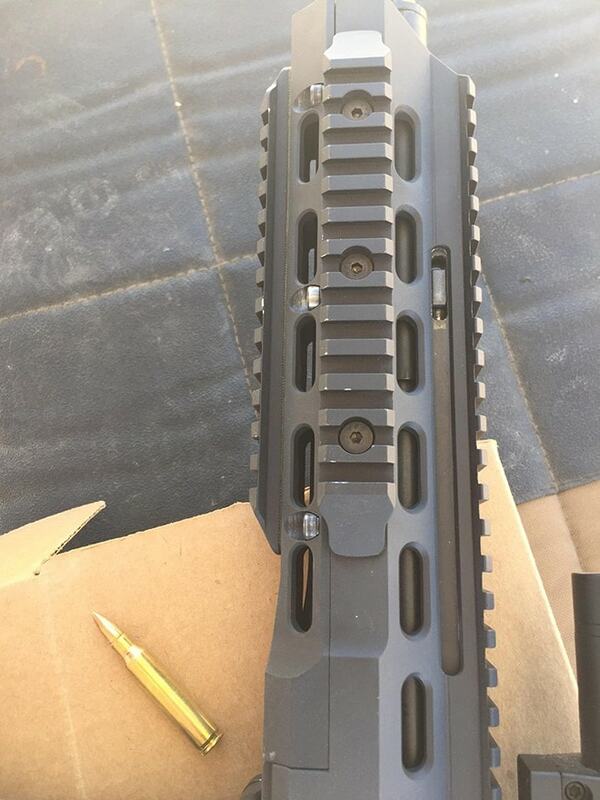 It’s a testament to how well Faxon has machined this upper. We did not attempt to change locations of the extractor or charging handle, as they were satisfactory as they were. This is an area where the company could improve by providing explanatory videos online. The extraction function is too important, from function and safety perspectives, to risk getting wrong just because good, factory-endorsed instruction isn’t available. The ARAK is compatible with folding stocks, though we didn’t test it with one. Faxon’s ARAK 21 is ahead of its time. The upper lends a dramatically longer menu of options available for any owner of an AR lower. With three caliber options, it’s an insulating choice in an uncertain ammunition market. It offers the user flexibility in how much a shooting session costs in ammunition. It’s also a great option for rifle-sharing families where hand dominance isn’t the same. Barrel options cater to the taste of “light and fast” or “heavy and slow” style handlers. Reading other reviews, there’s been some negative reaction to the MSRP of $1,199 for the upper in two calibers. I believe it’s a great value, considering the flexibility of ammunition and accessorizing, not to mention less total cost of a lower and an ARAK-21 is less than purchasing one each of a decent-quality AR and AK.